Everything is done through Speed Hunter at the moment, Hitch. You can order books and decals together right now. Sometime this week, the Speed Hunter domain will switch to the Reid Air domain, and all ordering will still be on one site. I pre-ordered mine and I'm looking forward to it. However, Jake, don't over do and hopefully, you get to take time for the holidays! They should be here today!!! Ill second Rob! I also was lucky enough to win an advanced copy. It is awesome! 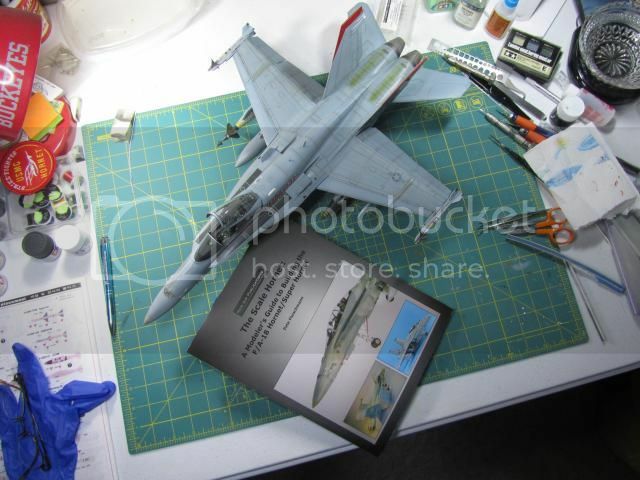 Plenty of interesting builds from several modelers over the whole range of Hornets. What I find even more appealing is how several modelers approached the same kit differently...using slightly different techniques and detail focus so that each build is unique in its own right. Thanks for the feedback, guys! I really appreciate it. I ordered mine but had to do it thru Reidair...the speedhunter link wouldn't work and I was told the web page didn't exist! Glad to hear the positive feedback- hope you all find it helpful! To all the builders who contributed, please PM me so I can get you your copies! Great book. Looking forward to digging into each page. The two sites were merged about a week ago. Speed Hunter no longer exists. Just paid mine ! . Waiting for it .... . Thanks again for shopping at Reid Air Publications/Speed Hunter Graphics! Do you think there might be a problem? Kelly, no there isn't a problem. Quite simply, I've just been too busy to put a tracking number in. With the Christmas holiday rush, USPS may be running a day or two late, especially since the books are shipped via Media Mail. If you don't get it soon, though, let me know so I can find it or send you another copy. what about cross Atlantic orders? How bout a Scale Eagle Book!